Electriciens sans frontières is an international NGO that mobilizes volunteers who put their expertise at the service of sustainable actions to provide access to energy, water and economic development (lighting, water pumping, economic activities, etc.) within the framework of development projects that benefit the poorest populations. We intervene in support of project management, leading training and/or project management. Electriciens sans frontières is neither a donor nor an organization that provides equipment. Are you the initiator of a project that you would like us to examine? Download and complete the following document and send it to us via the contact form at the bottom of page. Use the adjacent contact form to send us your project proposal. If you have any difficulty you can contact us using the details below. What happens once you've sent the project proposal? The document you send us is to enable us to identify the main features of the project and study the fit between our mission and that in your proposal. If it meets our criteria it will be put to our volunteer network through the various regional offices that carry out the projects. The volunteer team will then contact you to prepare together a complete file (technical and socio-economic study, preparing an implementation file based on any selected options, fundraising, implementation). Warning: being contacted by a volunteer does not guarantee the project will proceed. The file must be reviewed and approved by our various committees. The team of volunteers was able to carry out a model project, assisted by a local company and with the support of the villagers. 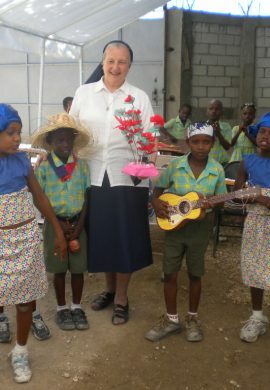 At the end of 2013 Electriciens sans frontières gave its support to the Congregation of the Sisters of Charity in Haiti. The first project undertaken was to bring electricity to two schools, three reception centres and a health centre in three isolated villages south of Port au Prince. After a few weeks to assess the needs, to size the solar installations to be set up, to assemble and transport the necessary equipment (sometimes on the backs of donkeys), the team of volunteers was able to carry out a model project, assisted by a Haitian company and with the support of the villagers. .